It was a hot contest to start the game and the Crows had lots of inside 50s but could not make the most of their opportunities. A nice handball from Stevie-Lee Thompson gifted Ebony Marinoff with her first goal. Marinoff opened the scoring for the match with her trusty left kick from a boundary stoppage. The Crows tackled ferociously in the first quarter and led the tackle count 11 to Geelong’s 4. Chloe Scheer the young gun midfielder booted through the Crows second goal. It was solid pressure from the Crows in their backline and they kept the Cats scoreless. The Crows led by 14 points at quarter time. The Crows continued their dominant gameplay well into the second term with their transition from attack into defense and defense into attack sensational. Danielle Ponter took a strong mark in the air and she converted the set shot truly. In the second term, the Cats backline were under significant amounts of pressure from the Crows forwards. Thompson nicely tapped the footy to Eloise Jones who kicked a nice dribble kick through the middle for a goal. In the second quarter, the Crows kept the Cats scoreless and scored two goals of their own. The Crows had an advantage of 28 points at the main break. Early in the third term, Scheer slotted through the opening goal of the third term and it was her second goal in the match. The Crows continued to be all over the Cats in and around the ball. Phillips tackled Olivia Purcell strongly and was awarded the free kick but could not make the distance with her set shot. The Cats gave away a free kick high to Irishwoman Ailish Considine in the forward 50 for the Crows. Considine nailed through the goal accurately from the set shot. With, the outside of her boot Ponter threaded the needle truly for goal and it was a remarkable goal. It was an incredible three-goal performance from the Crows, as they held the Cats scoreless again. The Crows were up by 48 points at three quarter time. McDonald tried to kick the ball out of their backline but unfortunately Jess Foley took an intercept mark. Foley converted the set shot kicking it straight through the middle. Defender Chelsea Randall was sent to the forward line in the final quarter and her move paid dividends straightaway, because she bent the goal right to left through the centre. Soon after, Ponter scored her third goal of the match in a fine display up forward for the Crows. Deep inside the Cats forward 50, Rochelle Cranston was given a free kick and then a 50m penalty. Cranston nailed through the goal from the goal square and finally the Cats broke through with their first goal with five minutes left in the match. Late in the final term, Marinoff booted through her second goal of the match. 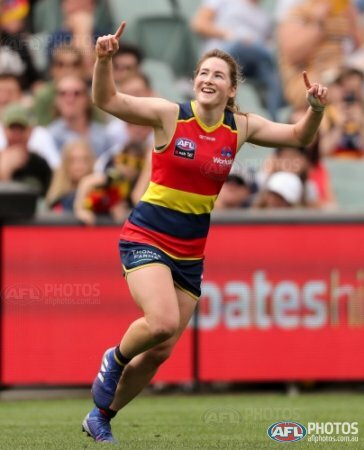 The Crows truly were a class above as they cruised to a 66 point victory over the Cats and they will be at the Adelaide Oval again next week when they host the Blues in the AFLW Grand Final.